This week I’ve been practising using diminished sounds to play on dominant 7th chords in jazz. If you want to bring a more jazz sound to your playing, using the diminished scale is a great way to do it. Because it creates an interesting series of inside and outside notes when played on dominant chords. What is the diminished scale? The diminished scale is what I would call a symmetrical scale. It sounds like it should be something very complicated but it’s actually very simple. In many ways it’s even more simple than a major scale. Symmetrical scales are scales that use the same intervals repeatedly. In the case of a diminished scale the intervals are a half tone (semi tone) and a whole tone. Symmetrical scales are also called modes of limited transposition or fixed transposition, which sounds even more complicated. But it still isn’t. It simply means that there are a very limited number of different ways you can transpose the scale. For example, because of the repeating intervals a G diminished scale is the same as a Bb diminished scale and Db and E diminished scales. So the idea of playing in 12 keys is a bit redundant. Another example of a mode of limited transposition is the whole tone scale. You can also use the whole tone scale to play on dominant 7th chords, but that’s another video for another day. There are only two different ways you can play a diminished scale, you can either start with a half tone or you can start with a whole tone. After that it just repeats the same patterns over and over. Which makes it quite easy to play, as I said before, in many ways easier to play than a major scale. 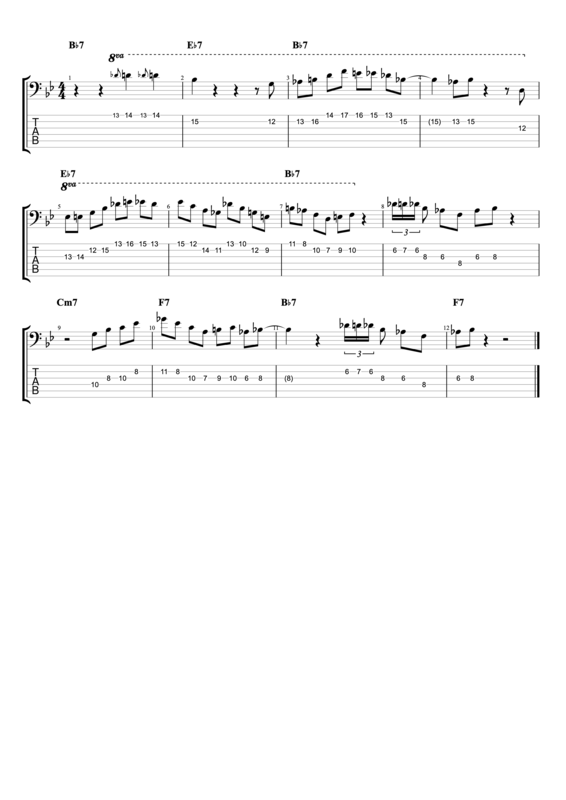 Here is an example of an arpeggiated diminished scale pattern that I featured in the video. In the video I’ve used the example of a Bb7 chord. Here is a diminished scale starting on a Bb and beginning with a half tone. I don’t always think about the scale starting on the root note. Often I will use the major third (D natural in this case) as a jumping off point. And in that case I will think of the scale as starting with a whole tone. Another approach that I use is to start on the #9 or minor third. In this case Db. In this case the first two notes of the scale will be the minor 3rd (an outside note) resolving to the major third (a chord tone). This is a real signifier of the blues and it will help give your diminished licks a bluesy flavour. As I’ve previously mentioned, the diminished scale most commonly gets applied to dominant 7th chords in jazz. Here is the same Bb half/whole scale written out with the intervalic relationships to a Bb7 chord written over each note. As you can see, the scale gives you all of the standard chord tones in a Bb7 chord. Root, major third, 5th and dominant 7th. However, it also includes one unaltered chord extension, the 13th, and three altered chord voicing, b9, #9 and #11. It’s these altered extensions that give the diminished scale a jazz flavour when you play them on a dominant 7th chord. The best way to demonstrate this is by playing a jazz blues, because the blues uses dominant 7th chords a lot. I’ve transcribed a chorus of blues solo that I improvised in which I was using both the diminished sounds and the more traditional blues sound of the blues scale. Check out next weeks Bass Practice Diary 30 if you want to look more at some of the diminished blues licks I’m playing here. This week I’ve made a very quick video to demonstrate the bass as an instrument. 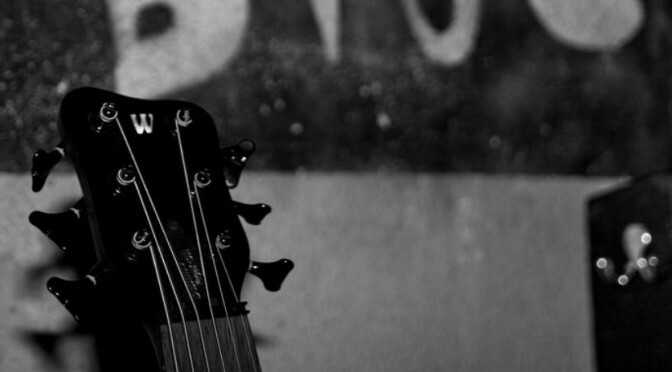 Specifically, it’s potential to play more than just bass lines. So, I’ve played a jazz standard on three different basses. Two of them are fretless, two of them are acoustic, two of them have six strings and only two of them are bass guitars! Read on to find out more! If you’ve followed my previous posts, you’ve probably realised by now that I don’t feel that bass guitars should be restricted to playing only bass lines. My instrument is the bass guitar. And the irony is not lost on me that in this video, all of the harmony is played on bass guitars except the bass line. Which I’ve played on an upright acoustic bass. The reason that I’ve done this is not because I think I’m a good upright bass player. I don’t think that. I don’t have time to practice the upright nearly enough. My upright bass skills will never be better than average at best. The reason is because it’s the traditional role in jazz for the acoustic upright bass to take the bass line. 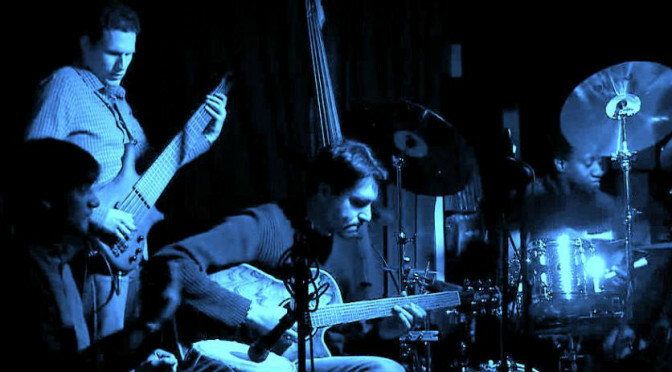 And I know from years of experience, that if you try and play jazz gigs on bass guitar, acoustic bass guitar or even electric upright bass, you will very often be treated as the guy who is standing in because the band couldn’t book an acoustic double bass player. I started to study upright bass when I was already at music college, and I did it with the aim of getting more jazz gigs. And it worked! For a while I was playing a lot of jazz gigs in London with my upright bass. But I very quickly stopped enjoying it. It’s a very difficult instrument to transport, especially when it’s impossible to park in Central London. The gigs didn’t tend to pay very much and the practice that I was having to put into the upright bass was taking away from time spent with my first instrument, the bass guitar. So I gave up doing gigs on upright bass and I started telling people who were calling me for jazz gigs that I could do gigs on Electric Upright Bass (much smaller and more portable), but not acoustic. Needless to say, the jazz gigs dried up almost instantly. I really enjoy playing acoustic upright bass at home, for fun. Although, I get precious little time to do it and I’m very rusty and out of practice. I’ve kept my upright bass all these years to play at home, even thought I almost never do gigs with it anymore. (I sold my electric upright). Do I regret my decision to stop taking gigs on acoustic upright bass? Not for a single solitary second. The upright bass is undoubtedly a beautiful instrument, but it isn’t my instrument. I’m a bass guitar player and I got to the point where I really didn’t look forward to doing gigs on upright bass. I found them to be a lot more hassle than they were worth financially. But all this underlines the point, that as bass guitar players, we shouldn’t be aiming to take on the role of the upright bass in jazz. It’s not what jazz bands are looking for. Jazz bands that are progressive enough to want a bass guitar in the band are clearly looking for something different. Hence, the reason why I’ve played all of the harmony on bass guitars in the video apart from the bass line. I’ve always believed that what we should strive to play is music, not just bass lines. Bass lines are an important part of music, they’re the foundation of most music. But there’s so much more music that we can also explore. And I don’t see any good reason why I shouldn’t explore all music, just because I choose to play an instrument that has the word bass in it’s name. With that in mind, I decided to make a very short and quick demo of three basses playing a jazz tune (Solar by Miles Davis). Each bass showing a different facet of what a basses is capable of. As I’ve already described, the double bass (upright bass) is playing the bass line, the roll traditionally reserved for double bass players in jazz music. The acoustic bass guitar is doing what jazz musicians term comping. Comping is basically when you use chord voicings to fill out the harmony. It’s a roll traditionally taken by piano or guitar. I’ve featured my acoustic bass guitar in a couple of recent posts. I’ve talked about how I use it as a harmonic accompanying instrument. So, rather than repeating myself, I’ll just leave these links for you to explore. 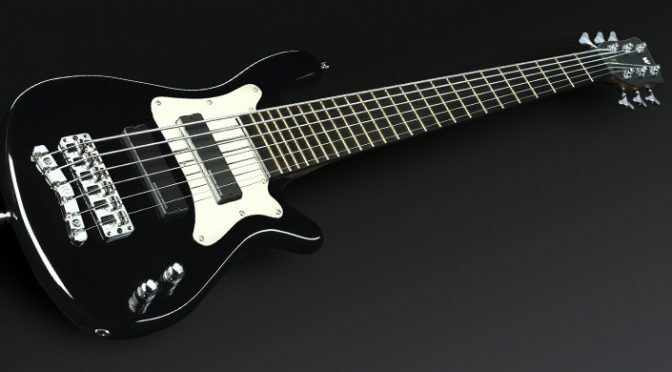 In the video the fretless electric bass is taking the rolls of melody and soloist. I suppose you could see this roll as being traditionally taken by vocalists and horn players. But, there’s actually quite a rich history of melodic bass playing in jazz. So it’s actually not that unusual to hear a bass take this role. In jazz usually everyone in the group gets a solo eventually! 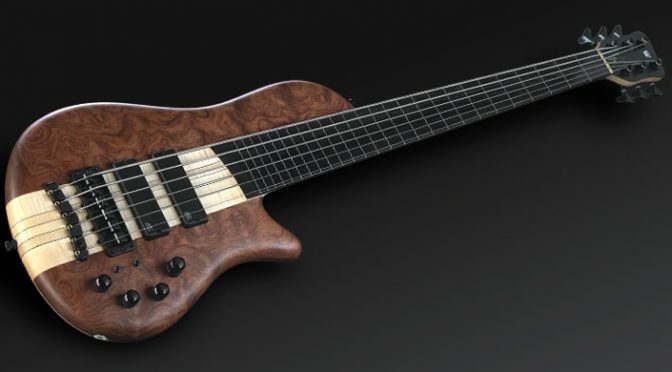 Read this post to learn my thoughts about using fretless bass as a melody instrument. 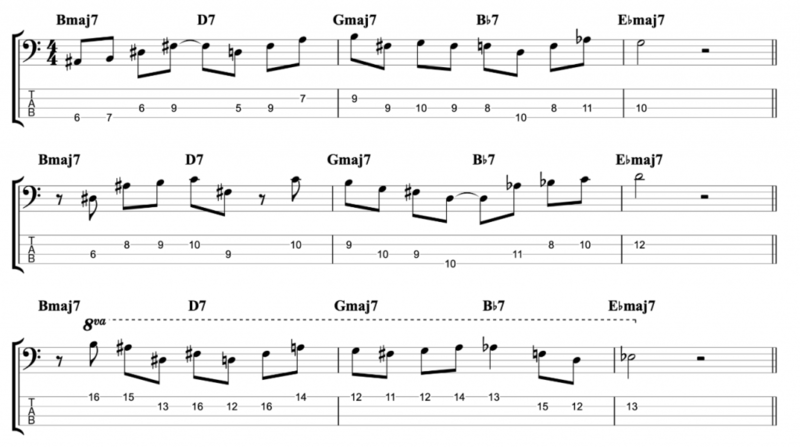 The best way to use “licks” in jazz is a subject that divides opinion amongst musicians. I’ve written a melodic jazz lick in the key of F major over a II-V-I chord progression. In this post I’ll explain the lick and also share some of my thoughts on the use of licks in jazz. What is a Jazz Lick? In this context, a jazz lick is a melodic phrase, like a musical sentence. It’s a small fragment of melody that can comprise part of a longer jazz solo. The debate amongst musicians tends to centre around whether or not it’s appropriate to use pre-learned licks as part of improvised jazz solos. It’s something that a lot of musicians do, including really good musicians, and the argument in favour of using licks is as follows. By learning licks, you are effectively learning jazz vocabulary. And the more jazz vocabulary you learn, the greater your range will be as an improviser. This is why I practice jazz licks or phrases. Sometimes I work out my own ones, as I’ve done in this video and at other times I play licks written by other musicians, as I have in this video. Personally, I don’t like to use pre-prepared licks when I’m performing or playing with a band. Improvising is the thing I love to do most in music. And I like to not know for sure where the music will go. Sometimes the music can suffer as a result of this approach, and if you’re looking for more consistency in your soloing, then learning licks is a good place to start. But, I wouldn’t choose to sacrifice the process of improving by using pre-learned licks. I’ve tried it and I just don’t enjoy it. To me it feels like trying to introduce a pre prepared sentence into a conversation. It might be a great sentence, but there’s every chance it won’t make sense depending on where the conversation goes. However, using licks is something that probably all improvisers do either consciously or unconsciously. We all fall into patterns of playing, often without realising it. I’m fairly certain that even musicians who are very against the idea of using licks, often unknowingly fall back on melodic phrases that they’ve played many times before. If you follow my Bass Practice Diary you’ll know that I like to play jazz melodies on fretless bass. So, when I do this kind of practice, I’ll always use my fretless. Having said that, the lick will also work on a fretted bass. I’ve TAB’d it for 4 string bass so everyone can play it. I sold my 4 string fretless bass after I got the 6 string Warwick Thumb SC in the video. That’s the only reason that I’m playing a 6 string bass in the video. The lick is meant to be played over a II – V – I chord progression in the key of F major. Gm7 – C7 – Fmaj7. The II – V – I chord progression is the most common chord sequence in jazz. I won’t go into the theory of it because there are so many articles in existence about II – V – I’s, like this one. I’ll just explain what I’m playing on each chord. I think the reason that jazz musicians love to play over II – V – I chord progressions is because the V chord affords a great opportunity to use outside notes. Whereas the II and the I chord tend to favour the use of inside notes. So, you can create a feeling of starting inside the harmony and then moving outside on the V before coming back in on the I. This is a very jazz approach. The feeling of taking the harmony out and then bringing it back in, immediately sounds like jazz. And it’s that sound that I’ve tried to demonstrate with my jazz lick. If you want to learn more about inside and outside notes and how to use them then check out this video. Here’s what I’ve played on the II chord Gm7. As you can see, all of the notes are in the key of F major, creating an inside sound. Which is fine because we’re about to step outside of the harmony on the V chord. There are several chromatic alterations in this bar. Playing a b9 on beat one is a very strong statement that I’m taking the melody outside of the key signature. I love this kind of bold harmonic statement. The other chromatic alterations (outside notes) are the #9 and the b13. The final note of the bar is also an outside note, but in this case it’s functioning as a passing note rather than an altered chord extension. It’s simply a semi tone above G natural to take us to an A natural on beat one of the next bar. How much outside harmony you choose to use is a matter of personal taste. I mentioned in the video that you could play a similar phrase on the V chord but with a natural 9th instead of the #9 and a natural 13th instead of the b13. It would go like this. Finally, on the I chord, F major 7, the lick resolves itself onto the major 3rd A. Which is about the most inside sounding note you can use at this point. As I’ve said, I’m not planning to use this lick again any time soon. For me, this is simply an exercise in expanding my jazz vocabulary so I can improvise lines in a similar way in future. But if you’d like to learn it, and use it in future, I would consider it an honour that anyone chooses to play one of my lines. I hope this has been helpful!